This week’s POTW goes twofold, in that we recognize not only the player, but also the venue. First, hats off to KJ Choi, champion of The Players Championship. KJ played solidly as ever, never wavering even when under extreme pressure of the field chasing him and trying to keep up with weeklong leader, David Toms. At -12, the leaders approached the tee of what is perhaps the most famous–and the most treacherous–par 3 in golf. With it all on the line, KJ Choi, cool as ice, struck a perfect ball to the island green within 12 feet, then sank the putt to go to -13, eventually winning the tournament. I’ve always liked KJ. He’s a consistent player that doesn’t get caught up in the emotions of the moment. Although his stroke isn’t anything to emulate, he gets the job done year after year. At 40 years old, KJ showed the young guys how to do it. Here’s to you, KJ. However, I have to give a nod, as well, to the tournament itself. The Players Championship this year gave us what golf has been missing for awhile: a true chase for a championship. Striking to me was the number of experienced golfers who were at the top of the field–Toms, Choi, Stricker, Goydos, and DLIII all had a legitimate shot of contending. Moreover, at the end of Saturday, there were 12 players within 2 shots of the leader (Toms). Perhaps its the course setup–with water on 14 of 18 holes–that prevents the younger “bomb and gouge” type players from overpowering the course. Perhaps its the severely undulating greens where the older players have better feel. Perhaps its the true risk/reward nature of the course, with so many pins hanging over water, where stronger iron players can gain an advantage over long hitters. Whatever the cause, the tightened field inherently leads to drama, and this year was no exception. Moreover, what we saw–for the first time since Tiger and Phil went at it at Doral a few years back–was a true duel to the finish. Toms, leading by 1, decided to try to put the dagger on 16, coming out of a hybrid and leaving it well-short, leading to bogey and a tie with Choi going to 17. Choi responded with the aforementioned man-up shot of the year that eventually earned him the crystal. With the tournament on the line, Toms, one-down to Choi, stood on the 18th tee (which I have always contended is a more difficult hole than 17 and perhaps the best finishing hole in all of golf) pondering what he had to do. Lesser men would fold to this pressure. Toms striped the drive of his life down the middle. His shot was not rewarded: his ball found a sand-filled divot. Again, lesser men would fold, but Toms placed his approach to 15 feet. Then, with the tournament on the line, he rolled a beautiful 15-footer for birdie on the last to pull even with Choi. It was just the fourth birdie of the day at 18. Choi, faced with his own pressure, rolled a tricky 5-footer for to save par and force the playoff. Although Toms 3-putted from 15 feet on the playoff, the drama of the event was the best we’ve seen this year. Players on all ends of the course had a chance to win. By Sunday, no one even acknowledged that Tiger Woods, the marquee player at any event, had pulled out of the first 9 holes on Thursday and was absent from the tournament. 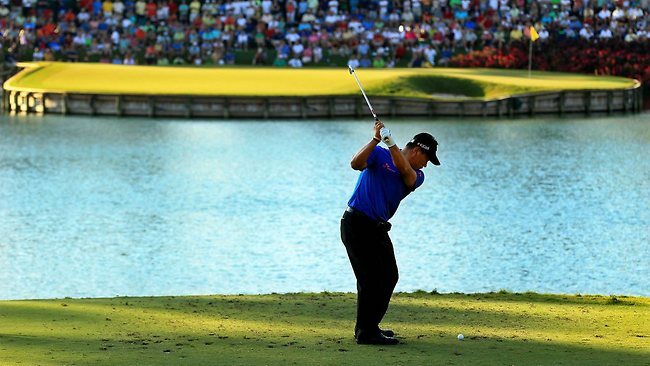 It’s hard to envision a tournament that is so exciting of itself that everyone forgets about Tiger; this was the one. At the end of the Sunday, Choi walked away with the crystal, but the true champion was The Players Championship. Once again, here’s to you KJ Choi. But also, here’s to The Players Championship, and to Sawgrass and Pete Dye for a course that can host this type of event. We’ve been waiting for this for awhile. Thanks for providing it.